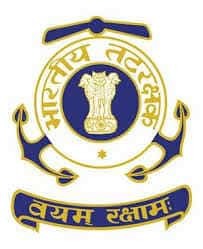 Home > Entranceexam > Indian Coast Guard Recruitment 01/2019 For Navik General Duty- Apply Online! Indian Coast Guard Recruitment 01/2019 for Navik general duty application process for 10+2 has started from online from 1 July 2018. 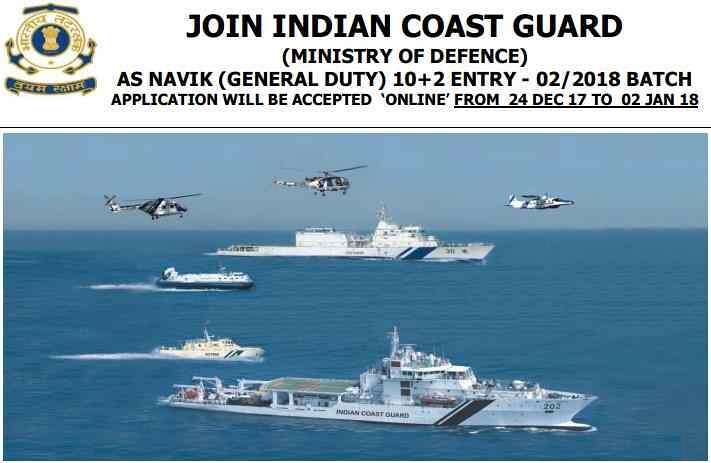 Online applications are invited from unmarried male Indian Nationals for Indian Coast Guard recruitment to the post of Navik General Duty (10+2) Entry in the Indian Coast Guard which comes under Ministry of Defence. It is an Armed Force service of the Union. The online application process will start from 1 July 2018 and end on 10 July 2018. Latest Update - Application to join Indian Coast guard as Navik General duty starts from 1 July 2018. Click here to apply now. The complete information about eligibility, application process, syllabus, exam pattern, pay scale, training, medical test, exam centres etc. is given here. The Indian Coast Guard was established in 1978 by the Coast Guard Act of the Parliament of India and has the responsibility to protect India's Maritime Interests, enforce maritime laws and guard the territorial waters of India. It comes under the Ministry of Defence and works closely with Indian Navy, Department of Fisheries, Department of Revenue (Customs), State & Central Police Departments. The General Duty Naviks serve as sailors, weapons systems operators, communication specialists, divers, etc. in specific maritime or aviation support roles. After qualifying all the stages and training at INS Chilika, the candidates will be finally posted at any one of the locations. Indian Coast Guard Candidates were earlier trained at Indian Naval Academy but post 2009 Mumbai Attacks the need for expanding the Indian Coast Guard was felt and the Indian Coast Guard Academy Foundation stone was laid in 2011 in Azheekkal in Kannur district of Kerala. Pay Scale: Starting Basic Pay Scale for Navik (GD) is Rs.21700. Promotion: Promotion prospects exist up to the rank of Pradhan Adhikari with pay scale Rs.47600 with the DA. Promotion to the officer cadre is subject to suitability and performance. Maximum Age: The candidate must not be older than 22 years i.e. between 01 Feb 1997 to 31 Jan 2001 (Both dates inclusive). For SC/ST and OBC: Upper age relaxation of 5 years for SC/ST and 3 years for OBC candidates. A candidate who has passed 10+2 examination are eligible to apply for the Indian coast guard recruitment exam for Navik general duty. Candidate must have scored a minimum aggregate of 50% marks in total and a minimum 50% marks each in Maths and Physics from an Education board recognised by Central/State Government. Relaxation in cut-off marks: 5 % relaxation in above minimum cut off will be given for SC/ST candidates and outstanding sports person of National level who has obtained 1st, 2nd or 3rd position in any field sports events at the Open National Championship/ Interstate National Championship. This relaxation will also be applicable to the wards of Coast Guard uniform personnel deceased while in service. Rejection of Application Form: Candidates who do not meet the eligibility criteria will be issued a Rejection Slip along with the Application Number which will mention the reason for rejection. Candidates can download the Indian Coast Guard Admit Card from 21 to 31 July 2018. The admit card will have the details such as the roll number, exam centre venue and date of the exam. Candidates can download their Indian Coast Guard Navik General Duty Admit Card from the link given below. Candidates will be shortlisted on the basis of their performance in Written Test, Physical Fitness Test (PFT) and fitness in the Medical Examination. Candidates belonging to SC and ST will be given due weightage while shortlisting. The first stage of selection for Indian Coast Guard Recruitment is the written test which will be conducted in Sept/Oct 2018 in six zones across the country. The candidates will get the exact date of the written test, time and venue of the recruitment will be given over the official website. The selection will be based on Higher percentage of marks for a particular examination centre. The syllabus for the written test is given below under Exam Pattern. The Candidates undergoing PFT will do so at their own risk. Only those candidates who qualify the Physical fitness test will be required to undergo initial recruitment medical examination. The Test will check the height, chest, weight and the hearing capability of the candidate. Height - Minimum height 157 cms. Reduction in height for candidates from hilly and tribal areas will be in accordance with the Central Govt. orders. Chest - Should be well proportioned. Minimum expansion 5 cms. Weight - Proportionate to height and age ±10% acceptable. Permanent body tattoos are not permitted on any part of the body except for candidates belonging to tribal areas communities. The candidates are advised to get their ears cleaned for wax and tartar removed from teeth prior to the examination. All selected candidates who are issued with a call letter for Final Medical Examination will have to undergo Final Enrolment Medical Examination at INS Chilka prior to enrolment. The list will be prepared from the candidates who qualify for all the tests depending upon the available vacancies. The Zone-wise select list of candidates will be displayed in the Indian Coast Guard Website in the month of July 2018. The Indian Coast Recruitment 2018 Merit List will be zone wise and not centre wise. The Zone Wise Select List of selected candidates for Navik (GD) 01/2019 Batch will be displayed in the month of Dec 2018/Jan 2019. The candidates whose name appear in the list have to report for Initial Medical Examination at Noida from 16 to 20 April 2018. Following candidates have to report at 08:00 AM with all the original certificate and 20 Latest passport size photographs (in blue background) - Coast Guard Selection Board, A-1, Sector 24, Noida, Uttar Pradesh - 201301. Candidates found fit during the final enrollment medical examination will be enrolled for basic training which will commence in August 2018 at INS Chilka followed by sea training and professional training in the allotted trade. Candidates are liable to be discharged as UNSUITABLE due to unsatisfactory performance at any time during the training. The written test will be objective type questions in English from subjects such as Maths, Physics, basic Chemistry, knowledge of English up to Class 12, general knowledge, current affairs, quantitative aptitude, and reasoning. English Synonymous, Antonymous, Rearranging, Unseen Passages. General awareness General Physics, Chemistry, Biology refer to the books prescribed in Class 10, 11 and 12. Two copies of admit card with the latest photograph affixed. Date of Birth Certificate: Original certificate of Class 10 for the date of birth verification. Academic Certificates: Original mark sheet and certificates of Class 12. Id Proof: Proof of identity such as passport, driving license, Aadhar card/ voter I card, School/ College ID card or any other photo identity proof. Caste Certificate (if applicable) in original as per Govt of India format. In case of reserved category applicants, availing age/percentage relaxation, either current or permanent address of online application should be same as the address mentioned in caste/category certificate (SC, ST & OBC). Further, in case of OBC, the category certificate should not be more than 3 financial Years old and for such cases, renewed/fresh certificate to be produced. Passport Photos: Ten recent colour passport size photographs. Original domicile certificate of their respective state issued by Tehsildar/ Sub District Magistrate/ District Magistrate. Note: Candidates not in a position to produce the above documents at the time of exam will not be permitted to appear in written exam. Original educational certificates will be returned after verification. Free Ration, Clothing & Medical Treatment: Candidates will be provided free ration, clothing, medical treatment for self and family including dependent parents. Government accommodation: Government accommodation for self & family on a nominal license fee. Leave: Every year candidates will be given 45 days Earned leave and 08 days Casual leave with leave travel concession (LTC) for self, family, and dependent parents as per the rules laid down by the Govt. Insurance Coverage: Candidates are given insurance coverage amounting to Rs.25 lakhs at a premium of Rs. 2500 per month as Group insurance. Retirement: Candidates will be given Contributory Pension Scheme and Gratuity on retirement. Travel Expenses: Candidates belonging to SC/ST, who are not employed by the Central/State Government, will be given 2nd class fare by train/ Govt bus/steamer charges of the shortest route if the home station is beyond 30 km from the place of testing on production of ticket. Noida: Indian Coast Guard Selection Board Noida, A-1, Sector-24, Opposite HCL Technologies, Dist. Gautam Budh Nagar, Noida, UP-201 301. Mumbai: Coast Guard Regional Headquarters (West), Worli Sea Face PO, Worli Colony, Mumbai – 30. Chennai: Indian Coast Guard Dist. HQs No-5, GM Pettai Road, Royapuram, Chennai- 13. Indian Coast Guard Admit Card 2018 - Released for all Centres! Indian Coast Guard Application Form 02/2018 Batch - Application Ends Today!